Easy Triple Coconut Cupcakes start with a cake mix but don’t taste like it! Coconut cake, a coconut filling, and a rich coconut frosting make this the perfect coconut cupcake recipe. Calling all coconut lovers: your new favorite cupcake is in town. This really is the BEST Coconut Cupcake recipe ever! Anyway, at one of these parties back in the day, I made cupcakes with Easter “grass” all over them (aka dyed green coconut). None of the kids would touch them because I guess kids don’t like coconut. At least, little kids, that is. Jordan likes it now…but back then, all that work for nothing. Now, instead of cute Easter egg cupcakes, I just make these triple coconut cupcakes because they’re less work and taste SO much better. If the kids don’t want them, fine. More for me! I really don’t understand why coconut only shows up at Easter…coconut is good all the time. I love coconut pie and coconut cookies and coconut bars all year long! These easy coconut cupcakes are perfect for any party or any gathering where coconut lovers will be. I think that means someone needs to make these for me…all the time. Guys – next week is Easter. I’m hosting brunch for 30…and today Jordan and I are leaving for Disneyland for the week. We’re taking my good friend and her two daughters, and another friend of Jordan’s. In case you lost count that’s four teenage girls and two moms. Hold me. Luckily, I have these cupcakes in the freezer for the brunch…and plenty of wine to get me through 3 days in the parks. However you make them, these cupcakes pack a coconut punch but leave your coconut craving satisfied. The cake is super moist and made with coconut milk, which adds so much coconut flavor. If you’re having a chocolate coconut craving, you can definitely substitute a chocolate cake mix! 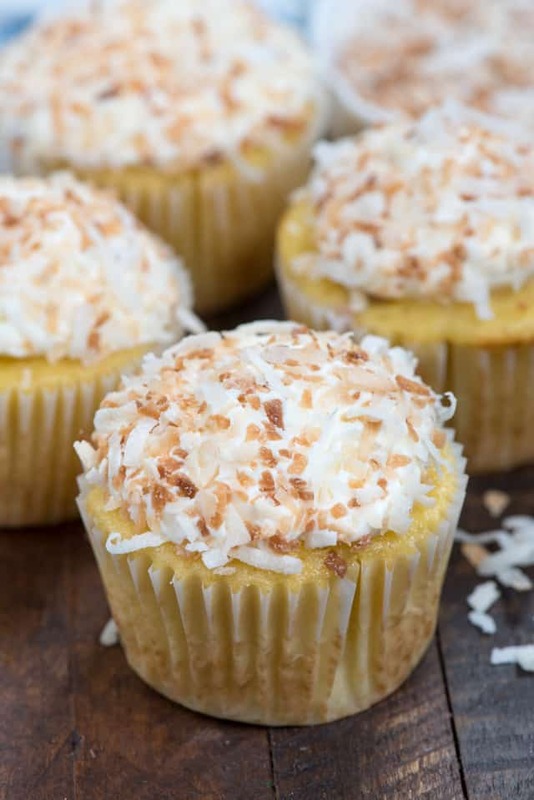 Easy Triple Coconut Cupcakes have coconut in the cake, a sweet coconut filling, coconut frosting, and a toasted coconut topping. That’s actually quadruple the coconut! What makes these TRIPLE the coconut cupcake? Well, let me tell you…there is coconut in every bite. Start with a cake mix. Use yellow or white (or even chocolate), or my homemade cupcake recipe. Instead of using water or milk, use coconut milk to flavor the cupcake batter. I also add coconut extract into the cake batter. This punches up the flavor more than milk ever will. You can find coconut extract at most grocery stores. I filled these cupcakes with a gooey coconut filling, reminiscent of an Almond Joy. You do this before they bake so the cupcake bakes up and around the filling. 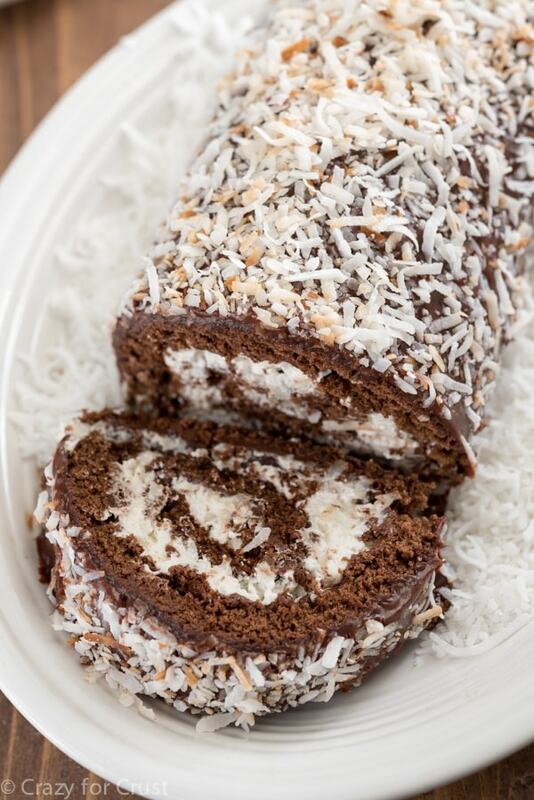 The filling and the topping are both made with toasted coconut. It’s easy to do but it’s also easy to burn. Be sure to check out my tips on how to toast coconut. The frosting is my favorite buttercream full of coconut extract and coconut milk. 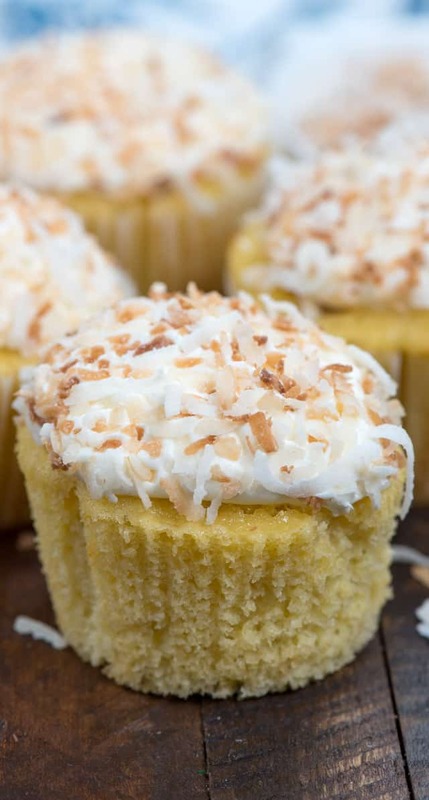 It explodes with flavor, especially when you top the cupcakes with more toasted coconut. Whenever you make these cupcakes, your coconut loving friends and family will ooh and ahh and want the recipe. I promise these will be a huge hit! 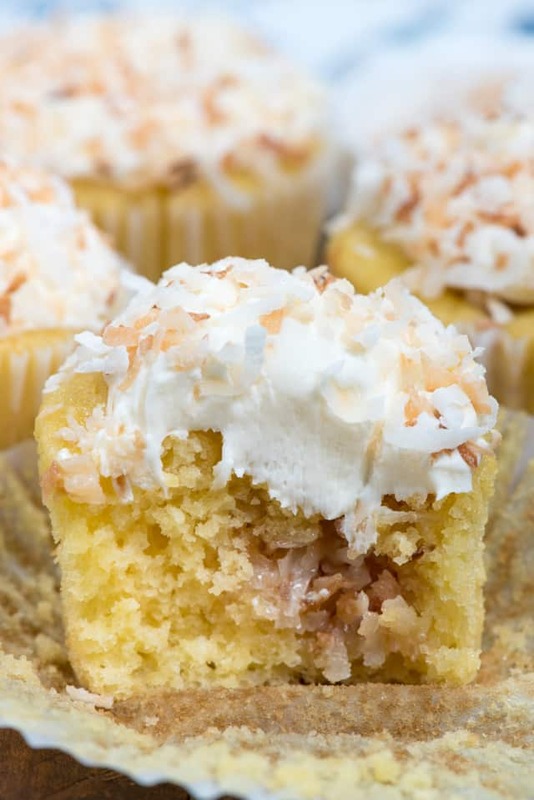 Easy Triple Coconut Cupcakes start with a cake mix but don't taste like it! Coconut cake, a coconut filling, and a rich coconut frosting make this the perfect coconut cupcake recipe. Preheat oven to 350°F. Line cupcake pans with liners. Stir together 1 cup coconut and sweetened condensed milk in a medium bowl. Set aside. Mix cake mix, coconut milk, oil, extract, and eggs with a hand mixer on low for 30 seconds, then on medium for 2 minutes. Divide batter evenly in the cupcake pans (about 3/4 full). Scoop 1-2 teaspoons of the coconut mixture onto the top of each cupcake. Bake 15-18 minutes until the cupcake springs back when touched. Cool completely before frosting. To make the frosting, beat butter with a mixer until smooth. Slowly beat in powdered sugar and mix until crumbly. Add coconut extract and 3 tablespoons milk and mix until smooth. If needed, add more tablespoons of milk to reach desired consistency. Frost cupcakes with a spatula or a pastry bag. Top generously with toasted coconut. 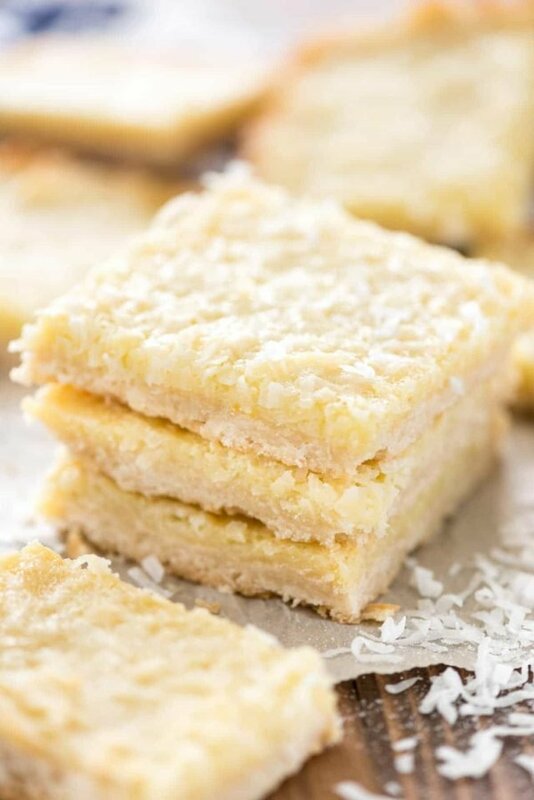 Gooey Coconut Pie Bars are perfect for coconut lovers! My favorite Coconut Cake Roll! 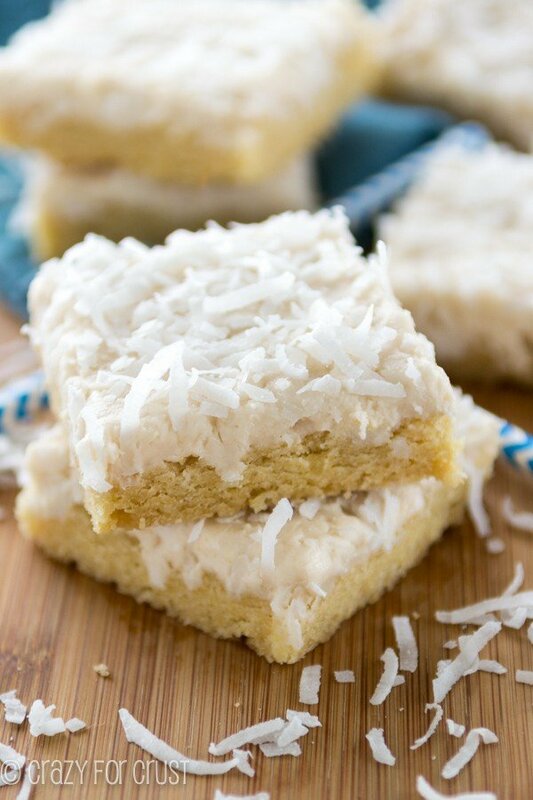 The best way to eat sugar cookies: Coconut Sugar Cookie Bars! These sound fabulous, Dorothy! Coconut is perfect for summer! Ohhhh man. I’m loving all the coconut going on in here, plus those wrappers are adorable. I love the solid colored with light polka dots, too! These look SO good. I adore coconut, going to have to try these soon! These look like Heaven! YUMMY! Those cupcakes look very yummy! You did a fabulous job styling and that says a lot because I don’t like coconut, but I can look past that to how fabulous the cupcakes look 😉 I love the contrast in colors! I love animal print cupcake wrappers! Its a struggle for me as well to gussy up my food sets. I usually just add one prop and call it a day! But these cupcakes don’t need anything else except that pretty cupcake liner. And that frosting. Thanks Nicole! It’s so difficult to think past the napkin..